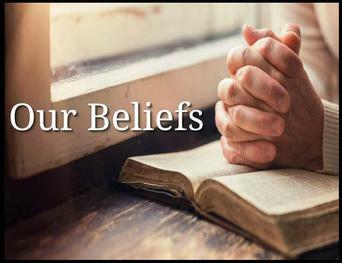 Members of the The American Presbyterian Church subscribe to the Apostles’ Creed and the Nicene Creed in their entirety and affirm the Reformed essentials as expressed in the Westminster Standards. 1. We believe in the one true God: almighty, all knowing, present everywhere, infinitely perfect in holiness and love, eternal, unchangeable, of one essence existing in three Persons (Father, Son, and Holy Spirit), the Sovereign Creator and Sustainer of all things, who created the heavens and the earth out of nothing by His spoken word, and for His own glory. 2. We believe that Jesus Christ, the only-begotten Son of God, and the supreme revelation of the Person and Character of God, became flesh through His miraculous conception by the Holy Spirit and His virgin birth. He who is true God also became true man united in one Person forever. During His ministry on earth, He taught authoritatively, gave us a perfect example to follow, performed many miracles and signs, and established His Church. Through His sinless life and substitutionary death on the cross He paid the penalty for our sins. On the third day He arose bodily from the dead. To His disciples "He also presented Himself alive after His suffering, by many convincing proofs, appearing to them over a period of forty days" Acts 1:3. He ascended into heaven where, took His seat at the right hand of the God where henceforth "All authority has been given to (Him) me in heaven and on earth" Matt.28:18. He now is our Lord, High Priest, Mediator, and friend. He will come again to the earth personally, visibly, and bodily to judge the living and the dead, receive His Church, consummate history, and fulfill the promise of His eternal Kingdom. 3. The Holy Spirit, the Lord and Giver of Life; sent from the Father and the Son has come to glorify Christ and to apply the saving work of Christ to our hearts and lives. He convicts us of sin and draws us to the Savior, indwelling our hearts. He gives new life to us, empowers and imparts gifts to us for service. He instructs and guides us into all truth, and seals us for the day of redemption. 4. We believe that our historical parents Adam and Eve, were created in Gods image, distinct from all other living creatures, as God's ruler/managers of His creation, and in a state of original righteousness. They sinned by rebelling against God's revealed will and thereby incurred both physical and spiritual death, and introduced death and decay into all creation. That as a result all human beings are born with a sinful nature that leads them to sin in thought, word, and deed. 5. Being estranged from God and condemned by our sinfulness, our salvation is wholly dependent upon God's initiative to extend His free grace towards us. This He has done in the sending of His Son to accomplish the work necessary for our redemption and in sending the Holy Spirit to accomplish the proclamation of the free offer of this redemption in the Gospel throughout the world. To those who put their faith in Christ alone for their salvation, God graciously gives as gift the righteousness of His Son and thereby justifies them in His sight, forgiving their sins. However, only such as are born again by the Holy Spirit and receive Jesus Christ become children of God and heirs of eternal life. 6. For those who having been forgiven their sins, had the ultimate power of sin over their lives broken, and have been adopted as children into Gods household, it is their privilege, their well-being , and their duty, hence forth to strive to imitate the good and Holy Character of their Father, to be disciples and servants of their Lord and Brother Jesus, and willing pupils of their companion and tutor the Holy Spirit, to seek to now learn to faithfully carry out through their own lives the good purposes for which The Father created mankind. 7. The true Church is composed of all persons who through saving faith in Jesus Christ and the sanctifying work of the Holy Spirit are united together as brothers and sisters in the body of Christ, the Family of God. The Church finds her best visible yet imperfect expression in local congregations where the Word of God is taught in faithfulness, the sacraments are administered with integrity, where scriptural discipline is fostered, and where loving fellowship is maintained. Her Lord Jesus has commissioned her to go into all the world seeking to provide a faithful witness, teaching and preaching the gospel , making disciples of all the nations, seeking good for all men, and yearning for her perfecting at His return. 8. We believe that God has appointed a day, wherein He will judge the world, in righteousness, through Jesus Christ, to whom all power and judgment is given of the Father. In which day all persons that have lived upon the earth shall by the power of Christ, be raised and appear before the tribunal of Christ, to give an account of their thoughts, words, and deeds. Those that are lost unto a resurrection of condemnation, but those who have received and rested on the mercy of God in Christ will be raised up in body and soul to dwell in the presence of God having their original purpose as rulers/managers of His creation restored in a New Heavens and New Earth throughout eternity. 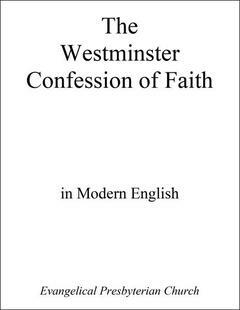 We subscribe to this system of Doctrine as explained in this Modern English Version of the Confession produced by the Evangelical Presbyterian Church.